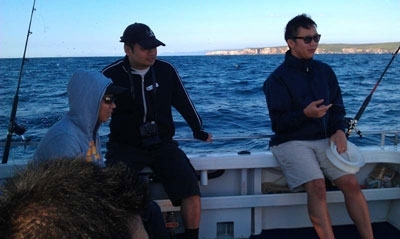 Went on another charter for a bucks night, this time with a different mob: http://www.deepseacharters.com.au/. Picked up from Balmain wharf at 6am sharp, we were on a fairly old boat, and seemed to take an age to get out to our destination which was past the heads. 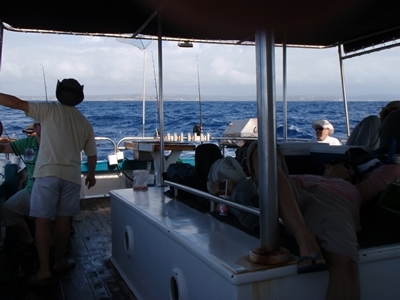 It took 18 on board, and we were fishing from the one side of the boat which was a bit of a squeeze. Some were feeling a bit queasy before we even reached our destination. It was quite a different style using one of these hand lines. 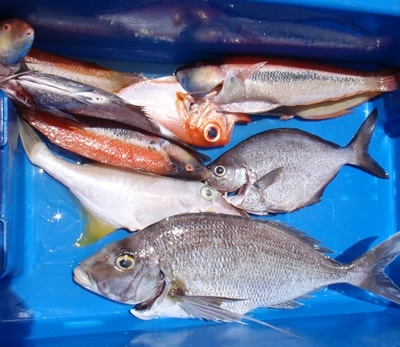 A large 1 pound snapper sinker was used to reach the bottom in a hurry, which was at times about 30m deep. 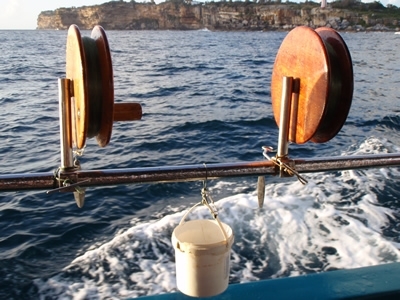 The wooden handline could then be cranked to bring the line back up. 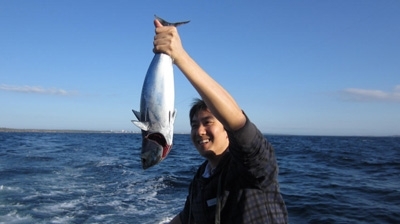 The main difficulty I had was feeling the bites, as the sinker was so heavy and the conditions rough, that I could not distinguish a bite. The ones I caught I did not feel even though they were on while winding up the line! 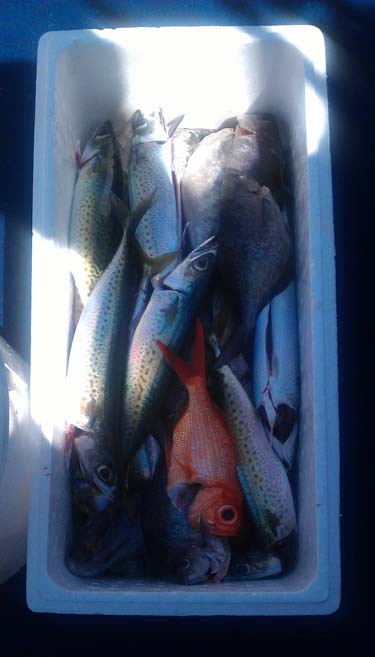 All up, the 6 of us managed a tally of: 1 huge morwong (or deep sea bream), 3 wrasse, 2 sweep, 1 leather jacket and 1 nannygai. Just a reminder, if you decide to go on a charter, remember to take some sea sickness pills (I used Travacalm). 4 of the 6 of us vomited at least once and I am sure I would have had I not taken the Travacalm in the morning! 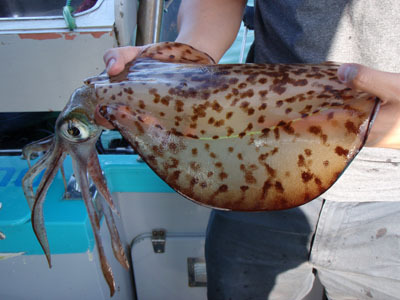 It would have also been ideal if we had our own bait, as we were just using frozen bait. We found that the others who brought their own bait (larger prawns) caught some flathead. Finally was able to head out on a charter that my girlfriend planned for my birthday way back in February. 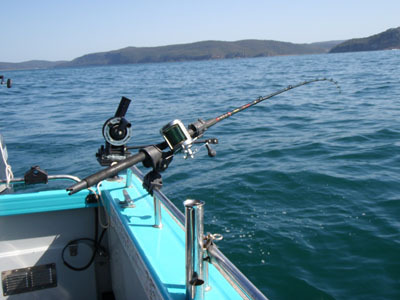 We headed down Pittwater way, where I have never fished before. Got there nice and early for the start at 5.30am after an hour drive. 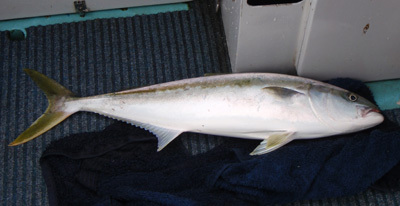 Met our charter skipper Peter who was keen on hooking us up with some kingfish action. 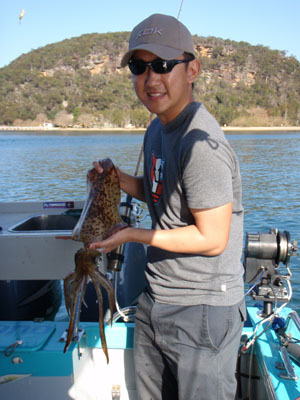 After a bit of setting up, we headed for the shallows to hunt a few squid. They did not seem to be on the bite after visiting a few spots. The last spot we visited started to fire up. 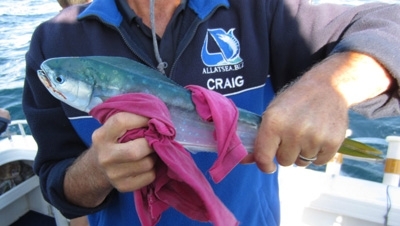 Hooked two in quick succession, one small calamari and one smaller arrow squid, perfect kingfish bait. Then on the last few casts, I hooked up on a big one. Took the drag out for a good 10 – 15m and gave a fair bit of a work out on the light gear. After a few minutes, I pulled up this beauty. After getting some squid for bait, we rounded up a few yellowtail and then the captain took over to set everything up to downrig a squid and a yellowtail to try our luck at some kingies. After a few hours of downrigging, and trolling around the shipwrecks, we were not able to manage any hits on our fresh bait. The captain has organised a make-up session in a few months time, so I’m looking forward to it. Another pic I found recently. This was caught last year at my mate’s bucks night as he is also a keen fisherman. Sorry, I lied about being all land-based, here’s my first off shore boating experience. There was a bit of a fight, but quite disappointed with size of my first one, I’ve caught yellowtail almost as big! Anyway, I should give a mention to the crew we went with, called All At Sea. Had a great trip, skippered by a guy named Roland. We saw a pod of dolphins on the way back which was a bonus.